KIEV, Ukraine -- The fighting in eastern Ukraine intensifies as pro-Russian rebels lose ground, raising fresh questions over the plans of Russia’s Vladimir Putin. The war is reaching a crunch point. Pushing forward with artillery and bombing raids, Ukrainian forces are recapturing territory and closing in on rebel forces in the east. The mood in Kiev, as Olexsiy Melnyk of the Razumkov Centre sums it up, is to “go to the end”—to finish the war by force. In a purely military contest, without an influx of heavy weapons or ground troops from Russia, the anti-Kiev insurgency would lose. The human cost could be high, but it would give President Petro Poroshenko a battlefield victory without making concessions to Moscow. Discipline is breaking down in rebel ranks, as the Kremlin pulls out high-profile proxies in favour of untested and unqualified locals who have the credibility of being from eastern Ukraine but neither competence nor experience. Donetsk and Luhansk, the two rebel strongholds, are under siege. This suggests that Russia’s Vladimir Putin may face a stark choice: to offer more support to the rebels with extra weapons and covert assistance, perhaps all the way to open invasion; or to pursue a negotiated end to the fighting that sees him withdrawing support for the rebels and facing an embarrassing geopolitical loss. That leaves Kiev (and its Western backers) with a choice, too: to allow the Ukrainian army and the battalions fighting alongside it to pound the cities occupied by rebels with mortars and rockets in the hope that the insurgency will simply crumble, or to seek to end the fighting by making some sort of deal—in name or in fact—with Putin. The next few days will see a flurry of diplomacy: Germany’s Angela Merkel visit Kiev on August 23rd and Putin will meet Mr Poroshenko on the sidelines of a Eurasian Union summit in Minsk on August 26th. The Americans are only sporadically engaged by the war in Ukraine, but the European Union—led by Germany—sees it as the greatest threat to security in a generation. Mrs Merkel is making her visit to support Mr Poroshenko and his government and to sound out his readiness for talks. She will press him “to make sure they don’t cross any lines that make it more difficult to take their side,” comments Constanze Stelzenmüller of the German Marshall Fund. The meeting in Minsk may produce little more than did a recent gathering of foreign ministers in Berlin, but the mere fact that the two presidents will talk face to face for the first time since June points to the scope for dialogue. In principle, both Kiev and Moscow should favour a political rather than a military end to the war. Mr Poroshenko would gain more from diplomacy than from flattening Donetsk and risking Russian intervention, and Putin would avoid the costs and risks of a military campaign. Yet there is no guarantee that the conflict will not escalate. Mr Poroshenko faces political pressure not to yield any ground, and after months with Russia acting as puppet-master and chief supplier to the rebels, distrust in Kiev is high. There is “no point in talks with Russia,” says Mr Melnyk. With Mr Poroshenko and those leading the war in Kiev seeing it as a fight for Ukraine’s survival, they will press on. For all the support from the West, Ukraine knows nobody will help—it has none of the illusions of Mikheil Saakashvili before the 2008 Georgia-Russia war. 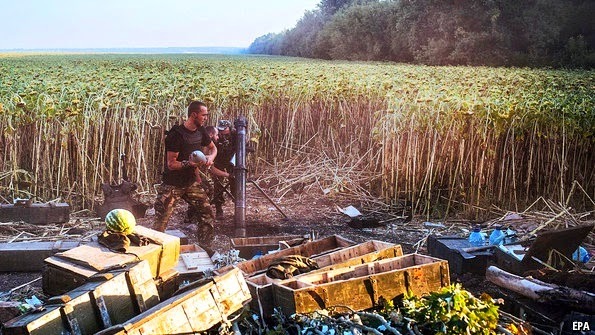 “Ukrainians are fighting and dying alone,” says Mr Haran. The language of war casts those who support the rebels as terrorists or Russian mercenaries. Post-war reconciliation in Donetsk and Luhansk will thus be exceptionally difficult. Ukraine is understandably preoccupied with finishing the war as soon as possible, but that leads its politicians to cut corners. A recent package of laws allows broad state authority inside the zone of “anti-terrorist operations” in the east, with police able to detain suspects for 30 days without charge and to open fire without warning. The laws were voted into force the day they were introduced. Ukraine needs a new Rada to replace the discredited one of Yanukovych, but if election rules are not reformed voters may elect a similar body. As for Putin, he clearly prefers not to send troops in an open, frontal invasion of Ukraine if other options are available. He could have constructed earlier pretexts for invasion. On the other hand, time and again he has chosen not to draw down the war but to escalate tension, trusting the West to acclimatise itself to each small increase in Russian involvement. At this point, it is impossible to divine Putin’s strategy or his goal. Unpredictability appears to have become an end in itself, a way of shrouding a policy of improvisation in a veil of mystic omnipotence. Moscow’s humanitarian convoy is thus not a piece of a larger, thought-through play, but a gambit—a way for Putin to regain the initiative in the crisis and to shift the conversation from questions over who shot down the Malaysia Airlines jet in July to the genuinely awful humanitarian situation in the east. It also allows Putin to show his domestic audience that he is doing something for the people of eastern Ukraine without sending in tanks. For Putin, Ukraine needs to stay fractured and destabilised: just how this happens is less important.